Alfa Romeo conquered the DTM with a car built to the Class 1 regulations, the Italians sweeping both the drivers’ and makes’ titles. And it wasn’t because the competition was weakened by the withdrawal of BMW and Audi, either. Rather, the experience the team had gained with the World Rally programme provided the perfect springboard to get the best out of the Class 1 regs. 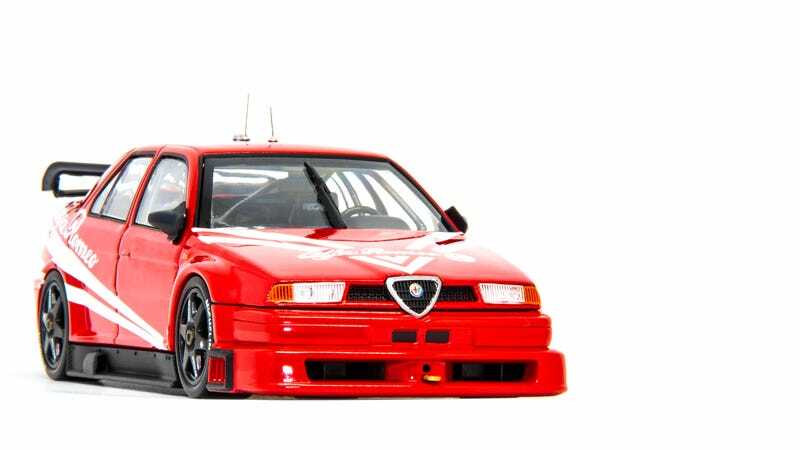 My Radcast entry would be the dominant DTM winner from 1993 to 1996 –the Alfa Romeo 155 V6 Ti. Thanks to the portable version of Gran Turismo, I was able to experience this all-wheel-drive turbo-charged beast and fell in love with it. This un-stickered 1:43 rendition comes from my favourite (yet defunct) scale model brand, HPI Racing. From all the angles to choose from, those up-turned exhaust tips really sold me on the looks of this car. It must be a treat to have four trumpets pointing skywards to play you the song of the title-winning Alfa Romeo V6. I’ll now leave you with these pictures, the hunt for more HPI model continues.